Padlet Mini is a handy new toolbar extension for Chrome and Safari that’s designed to help users collect and curate web content in a couple of clicks. Bookmarking with Padlet mini couldn’t be easier or more efficient. With the extension installed, users who discover web content worth collecting can click on the Padlet icon in the toolbar and select an existing Padlet to post content to. Click once more and the content is displayed on your Padlet wall. The Padlet Mini extension works similarly to other toolbar bookmarking tools, but the possibilities for using Padlet in the classroom have put Padlet Mini at the top of my list of quick click bookmarking tools. Content collected on a Padlet can be viewed without leaving the page. When viewers click on a thumbnail on Padlet, a new screen appears, displaying an embedded version of the content. This is unlike other popular bookmarking tools that display images linked to another destination. Viewers do have the option to visit the source through a button at the bottom of the screen, but the viewing experience right on the wall is quite impressive, since it supports live multimedia. Users can create an account and design an unlimited number of Padlet walls for a variety of purposes. Students can contribute to Padlets without an email address, making it a great tool for turning in and sharing digital work. Just tap or click on a wall to add content. Padlet works well on a computer and also from the web browser on an iPad. There’s no tape or physical space limitations with these types of walls, providing classrooms with the ability to share work with others who are unable to physically visit the school. Padlets can be used for collaboration. Padlet is capable is displaying text and a wide variety of multimedia, including ThngLink interactive images. Padlet can be embedded into a blog, wiki or website. 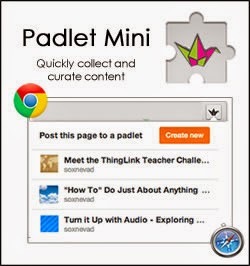 Padlet mini is a bookmarking tool worth exploring. Chrome users can get the free extension from the Chrome Extensions Store. Safari users can get the Padlet Mini from the Apple Extensions Store.